The weather is swiftly growing cooler and it makes me reconsider my rooms and accessories quite a bit more. I love to use seasonal shift inspiration to rethink, reconsider and ponder how each piece of art or adornment makes me feel and think about how I would LIKE to feel in that space. We naturally gravitate towards art that makes us feel a certain way (happy, thoughtful, romantic, etc). So I always trust my instincts when making selections for framed creative works - our topic of the day. When it comes to art, in most cases I like a bold move. Massive abstracts. Huge sculptures. Sizable textured wall hangings. Of course in that grandness I require incredible detail. Confident brush strokes, Opulent materials. Unexpected materials. God is truly in the details, but when it comes down to owning it I crave more massive pieces. One look at the above gallery of images supports my belief that art can totally "make" a space. 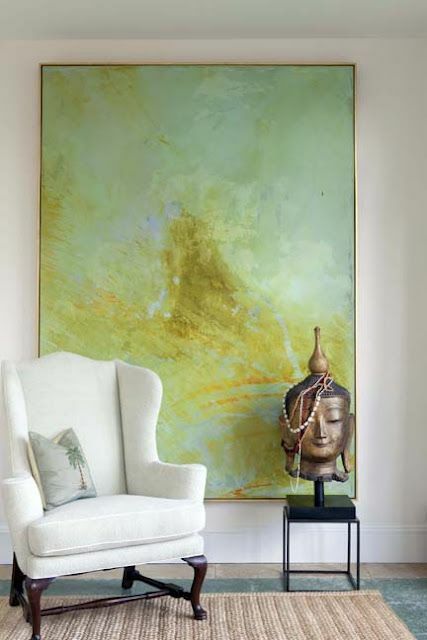 An otherwise serene (or in some cases quite straightforward) rooms can come alive with the pop that a handsomely scaled abstract work can offer. Whether you love yours painted or printed, framed or free, I think you'll agree that adding color and style to your walls is a genius move in any space. Here are some of my favorite pieces from my recent searches.